When I was a teenager in the 90’s, I can remember watching the increase in popularity for Dark Horse Comics. Characters like Barb Wire and X, stories involving Star Wars, Aliens, the Terminator, and Predator franchises all flooding the market. One title that peeked my interest was Concrete. Who was he? What was he all about? How on earth did he get that way? These questions and more flooded my head when I went into my local comic shop to pick up the latest issues of Spider-Man or Superman. I can’t say why, but I was always leery of picking up an issue. It intrigued me, and I’d always have it in my hand, but then I’d see something shiny or flashy, and Concrete would be put back on the shelves. It wasn’t until last year that I finally took the plunge and grabbed two Concrete side issues out of a dollar bin. I read them, and though they didn’t strike me as awesome and amazing, it was the conversation that Jason Newcomb and I had that lead me toward picking up this first issue. Let’s take a look at what I thought of Paul Chadwick’s Concrete #1. It starts out simply enough. Grad Student and self proclaimed novelist Larry Munro is putting his charm on a lady named Alice. 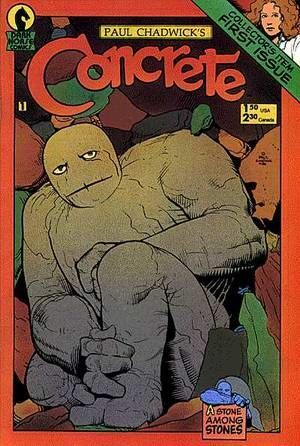 By this time, the events in Dark Horse Presents #1 (Concrete’s origin) have taken place, and his likeness is everywhere. People believe him to be a product of the government, a cyborg, let loose on the populace to acclimate himself to human society. In actuality, Concrete was a man, who had his brain transplanted by aliens into the massive body that he now calls Concrete. OK, back to Larry. One thing leads to another, and he ends his short lived date with Alice before it even starts. Fate would have it differently for him, as he sees an ad placed on a bulletin board. A handicapped author is looking for someone who can be an overall general aide. Help with typing, have a sense of adventure, that sort of thing. Larry makes a quick phone call, and he’s on his way. About an hour later, he’s greeted by none other than Concrete. The rest eventually becomes history. Now, I know that doesn’t sound very exciting, but believe me when I say that this story is worth taking the time to read. Paul Chadwick took great effort to ground his story in as much reality as he could. Concrete is bound by the laws of nature. He’s too heavy to sit on anything normal, so he has a cinder block chair made for him. His weight affects him in water, so he sinks, but can only hold his breath for about an hour. The laws of physics apply in this story, but Concrete’s body does allow for some bending of the rules. The story Paul Chadwick writes is one, I think, of personal growth. With this new-found body that Concrete has, he hires Larry to go with him as he does new and daring things he couldn’t have done as a human. Though the body of Concrete is stone, the brain inside is still very much human, with human emotion. The way Paul writes Concrete is exactly like his character: rough on the outside, but very soft inside. Concrete comes off as brash on some occasions, but his emotions (or thought bubbles) tell a different story than what the characters in the comic get. Concrete wants to be grandiose in his events and portrayal of himself, but other people have different ideas for him. Paul Chadwick is able to intertwine this into one very smooth, yet amazingly powerful story. As for his art, Paul Chadwick draws amazingly well. It’s very real, very normal looking in the aspect of how he draws his people. Nothing overly fancy or flashy as you look over this issue. That’s what it needs to be though. For something like this, we don’t need massive amounts of muscle or guns the size of a building. Here, we need something relatable, something grounded in reality, but with the exception of Concrete. When he is on the page, your attention is drawn to him, as it should be. He is the only thing that is drawn as larger than life, and in this readers eyes, that’s exactly how he looks. One thing should be noted here. The entire issue, and I believe the series, is entirely in black and white. With a series like this , black and white is the perfect medium. It allows you to focus not only on the artwork but also to interact with the story a little bit. Paul does have of the work for us. He writes and pencils. We add the color to his world, and I think that adds immensely to the story. In the world of Concrete, he is a man trapped in the body of an organic rock. Just how interesting would that be? Is it something you would want to have happen to you? The questions Paul Chadwick answer in these pages might make you think a little differently. Though Concrete is nearly indestructible on the outside, he very much feels pain on the inside. His emotions are what drive him, and that in turn makes him very human. Though all of his adventures seem like good ideas at the time, it almost seems like nothing ever goes right for him. That part of the story is what makes it so interesting to read though. In the end though, Concrete is very much at peace with who he is, and what he’s about. Reading this story gave me that “full” feeling, and when you get something like that, you know you’ve got a great story in your hands. If you can locate “think like a mountain” that’s a great series. It explores environmental issues. The letters pages are quite fascinating. One of my favorite parts was in the forward, when he made light of the fact that most artists, including himself, didn’t stay consistant in drawing some of the characters, and that people liked to point that out in the letters pages. I thought that was pretty funny. I’ve always been curious about Concrete, thanks for the great article! These are a great read, well written and indepth.